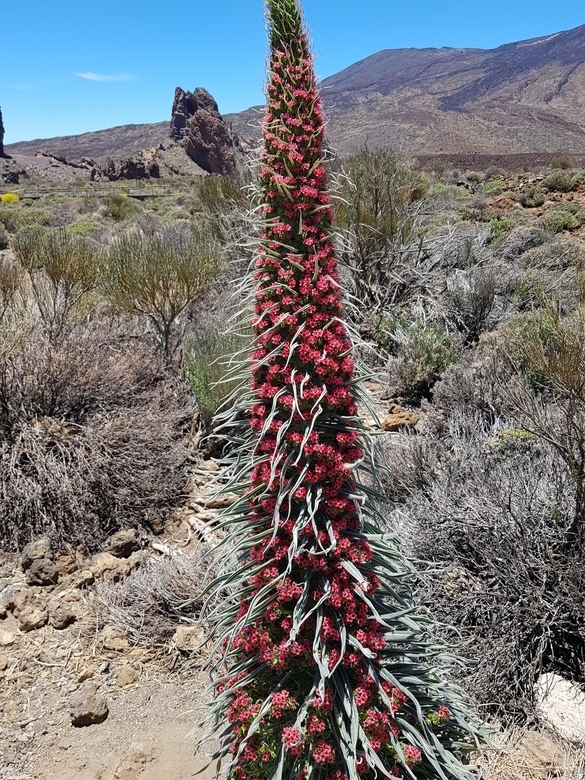 The red Tajinaste is an endemic plant of Tenerife and is mainly found in the Southeast area of ​​the Teide’s valley, towards Vilaflor. 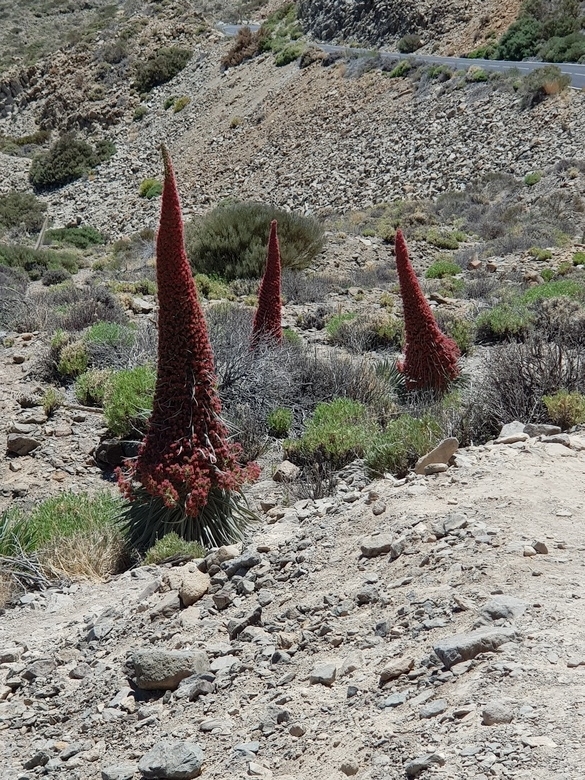 Its name derives from the word guanche “tainast” which means needle, probably due to its peculiar spear shape. 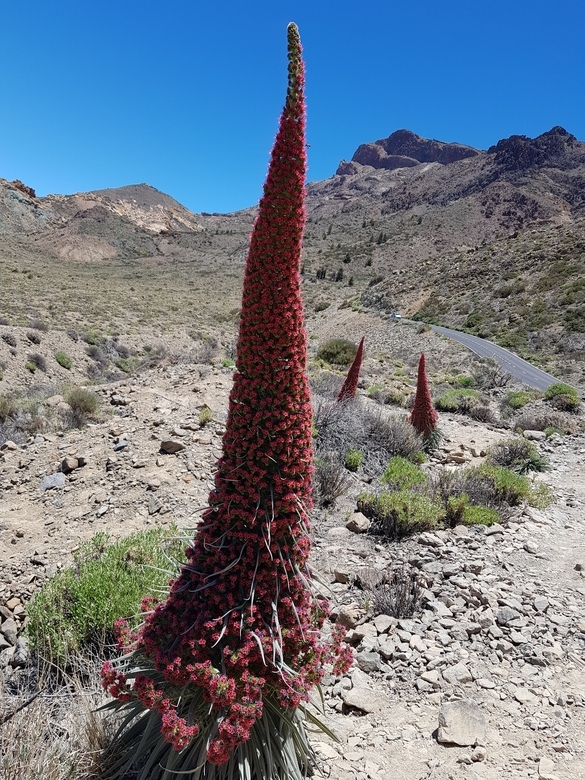 The linear leaves and the characteristic red coral flowers are one of the major attractions of Tenerife during their flowering period, between May and June. 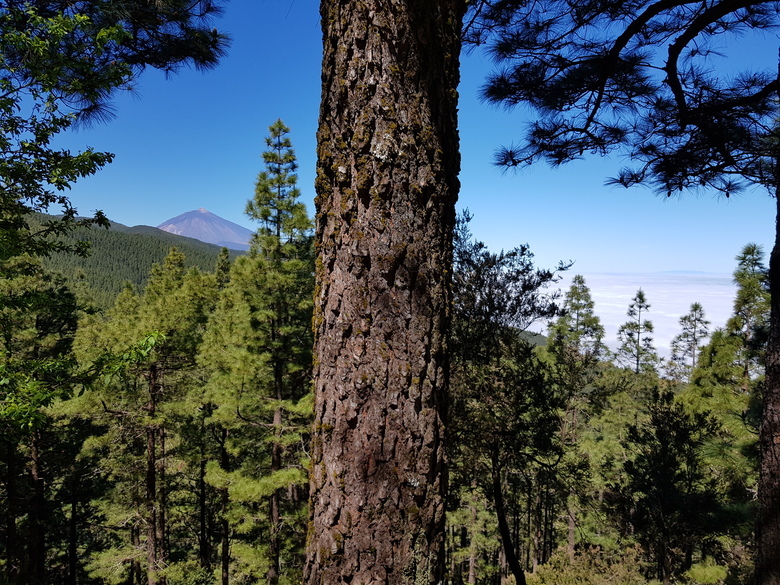 For any reason you are in Tenerife, a visit to the Teide National Park is a must. 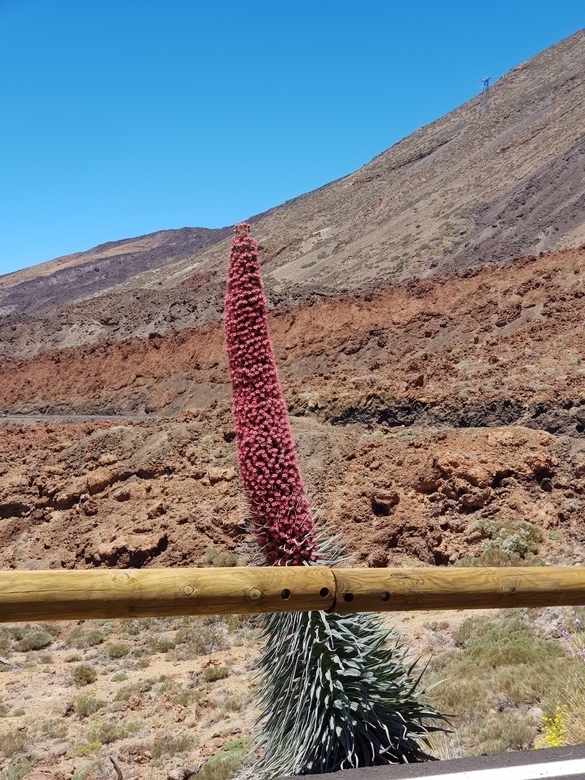 With its height of 3718m, the volcano dominates the valley that in the spring turns into a red and sharp sea, making the scenery even more surrealistic, so as to give this plant the name of Teide’s Blood. 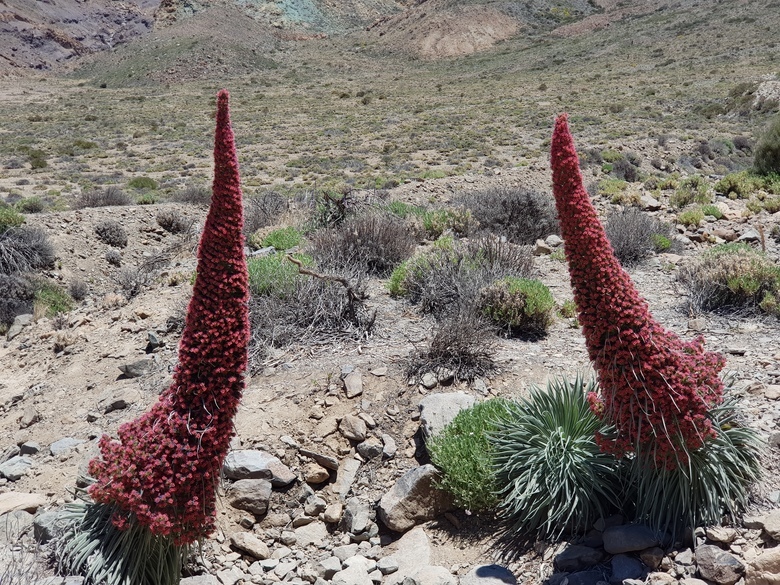 The air that reigns on the Teide is impregnated with magic; walking through the various paths in search of these fiery spears can become a pastime for families, friends and organized groups that gather each year to admire the flowering. 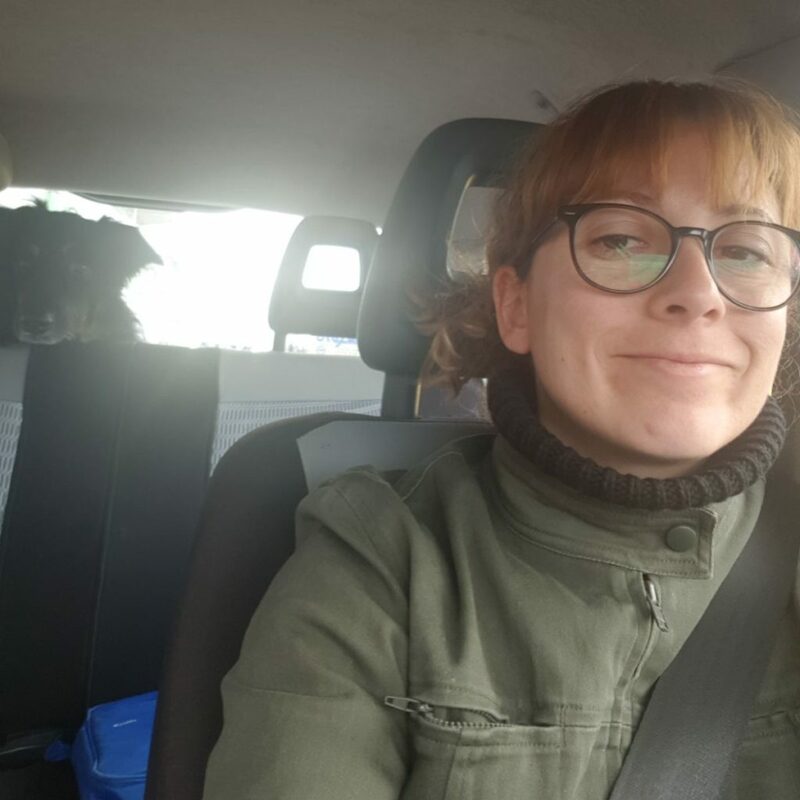 It is the perfect place and time to reconnect with yourself; the mountain air, the scent of flowers and the buzz of bees in the background help the body to regenerate and the mind to relax, so that after a day in the National Park the energies are completely recharged. The guards of the National Park are very helpful and an inexhaustible source of new information. 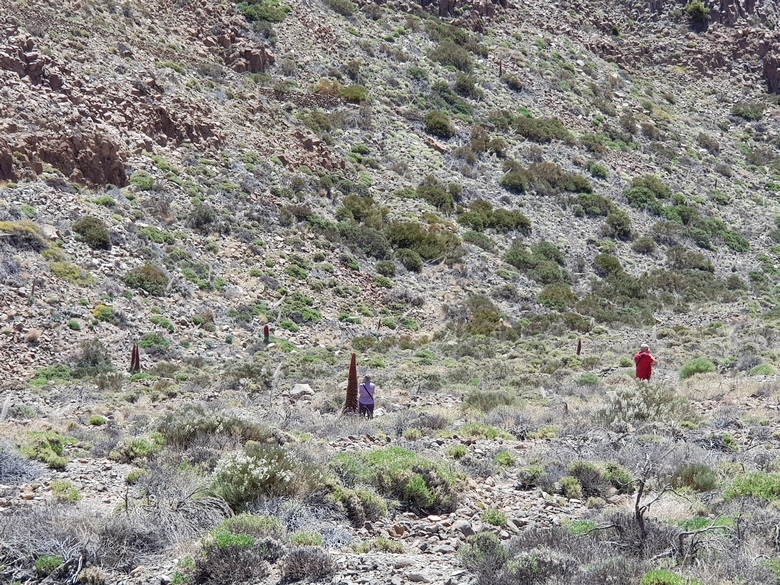 On the last visit Pato and I did, we learned that the gorge between the “Montaña Blanca” trail and the cable car is a protected area for mouflon control. 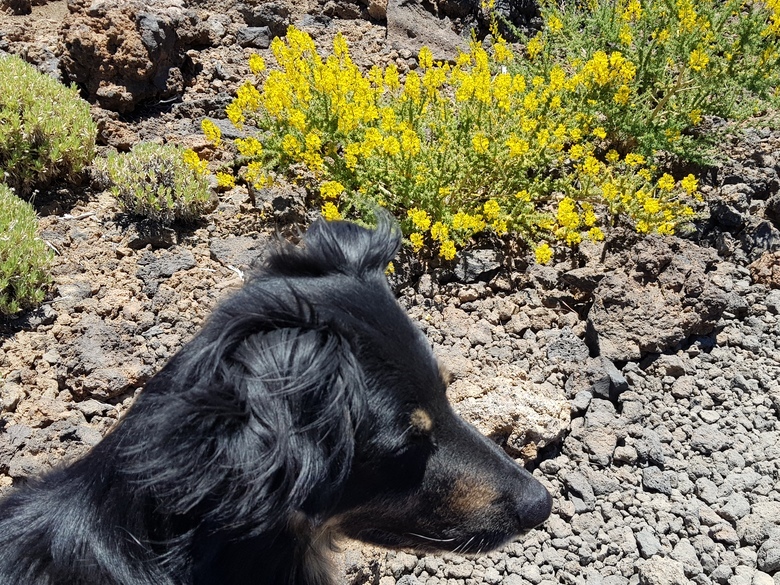 The presence of the flowers of Tajinaste is of great importance in the production of honey in the area. It is not uncommon, approaching one of these plants, to see a bee engaged in its harvesting work. The result is one of the best honeys on the island, which I highly recommend tasting as soon as possible. 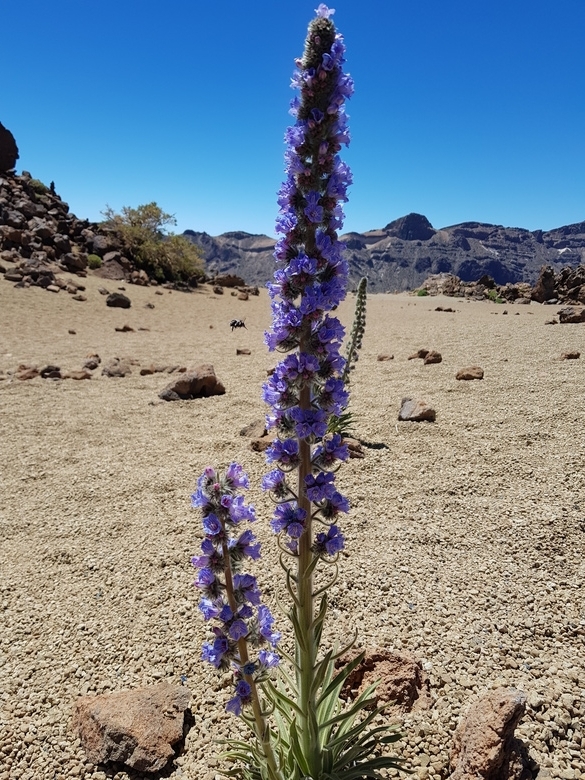 This year, due to a frost that has swept the area in April, the amount of tajinaste in bloom has drastically decreased, so that ours was really a “hunt” to be able to find some specimen to photograph, although it’s worth it because in this way we have been able to experience new paths and discover other beauties that the Teide National Park has in store for its visitors. 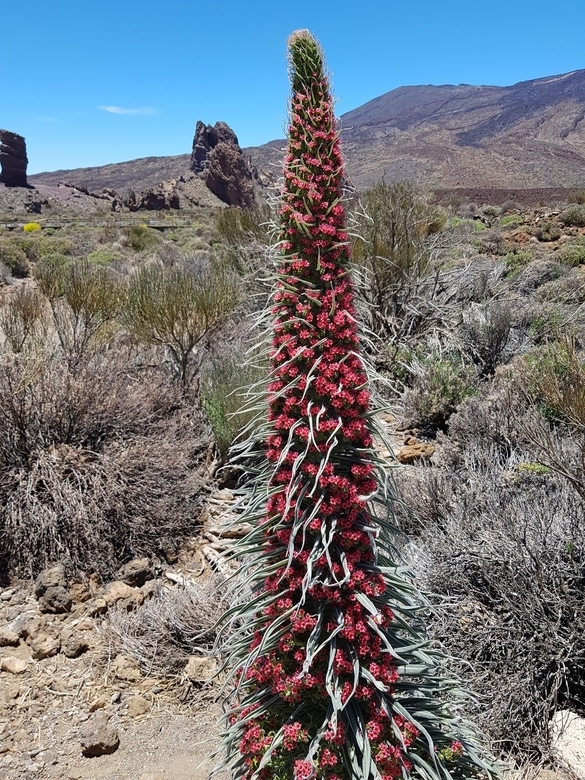 I highly recommend to those who want and have time to plan a visit to the valleys of Teide for the period of flowering of red Tajinaste. 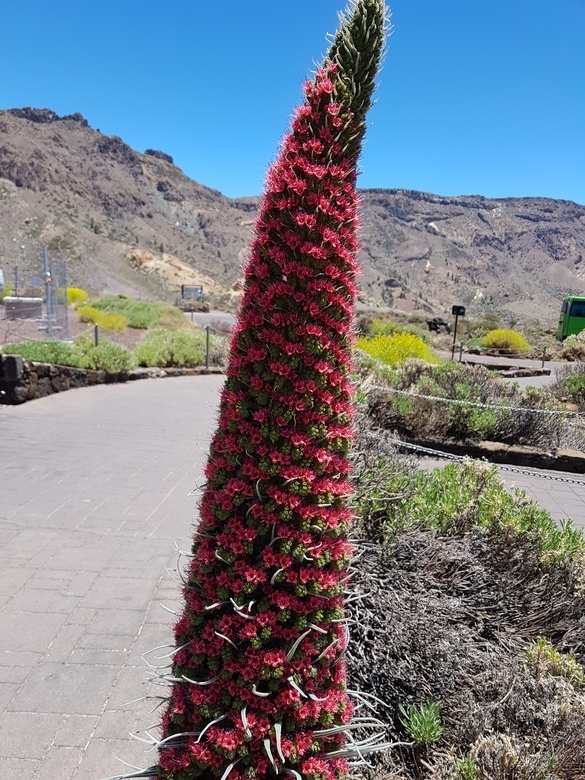 It can be one of the experiences to remember of Tenerife! ¡¡Important!! 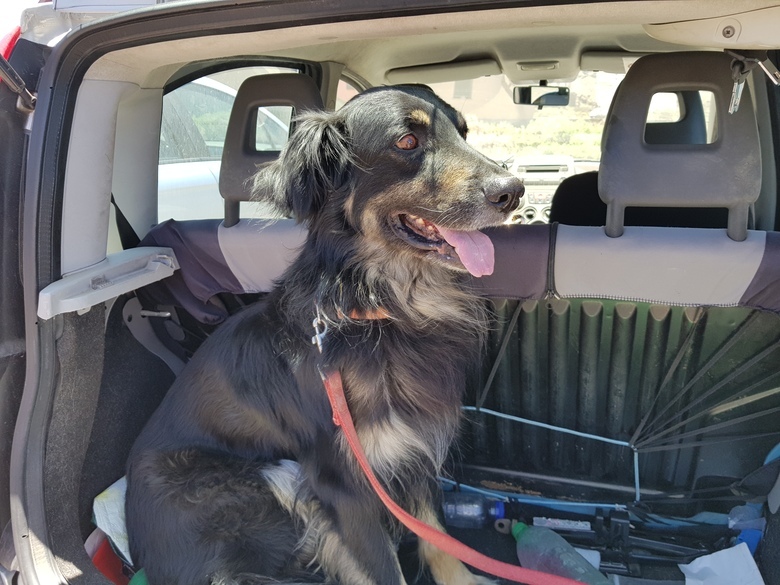 If you liked this article, share it so that more people can read it and consider the idea of ​​a trip out of town!